The latest issue of the SEALG Newsletter has now been published and is available freely on our homepage www.sealg.org. It includes articles on Thai royal editions of the Buddhist scriptures by Larry Ashmun, two previous exhibitions in Mandalay and Rangoon by San San May, special collections at the Southeast Asia Studies Library in Frankfurt/Main by Holger Warnk, and on the preservation of endangered archives (and manuscripts) in Southeast Asia by Jana Igunma and Jody Butterworth. 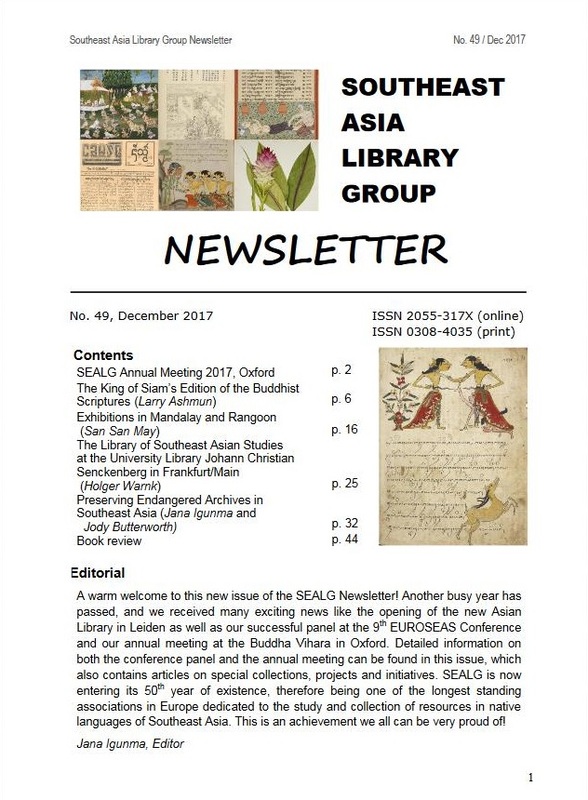 Previous issues of the electronic newsletter which covers all aspects of Southeast Asian librarianship, curation, collection, custodianship and research can be accessed on http://www.sealg.org/newsletters.html.